.Since I was a child I have enjoyed drawing and making things. Over the years I used a variety of creative skills in my career including restoration specialising in carving and gilding. Watercolour and pen & ink has been one of my main painting mediums over the years. For a long time I took on commission work and illustration whilst I was involved in teaching art to community groups. I still love to paint and experiment in different media. However my work has nearly always involved photography as some kind of starting point but wherever I can I try and draw from life. I have come to the conclusion that there is nothing wrong with using photography as part of a process, in fact at Art school we were actively encouraged to do so, it was an exciting time we lived in then and now we can see it's fruition in this digital age. If you look at my sketch books during open studios you will see the progression and thought processes derived from this media and how it can lead up to a finished work. Individually, the photographic and the printmaking processes produce their own fascinating and often unexpected results, whilst allowing artist's to push the boundaries. Personally as someone who was always so involved with recording the minutia of detail, these processes have helped me simplify things in order to see the shape, pattern and texture of things required in the process of making an image. I also still indulge in drawing, painting, collage and other mixed media and sculptural processes as it is essential to an artist's progression of skills as well as my own therapy. As an artist I am interested in environmentally conscious works using specific materials to explore our relationships to the spent resources around us. I have been actively relief printmaking with re-used polystyrene to highlight the inadequacies of our recycling facilities and overproduction of waste. I have run print workshops themed around this and exhibited my own prints made using this material. 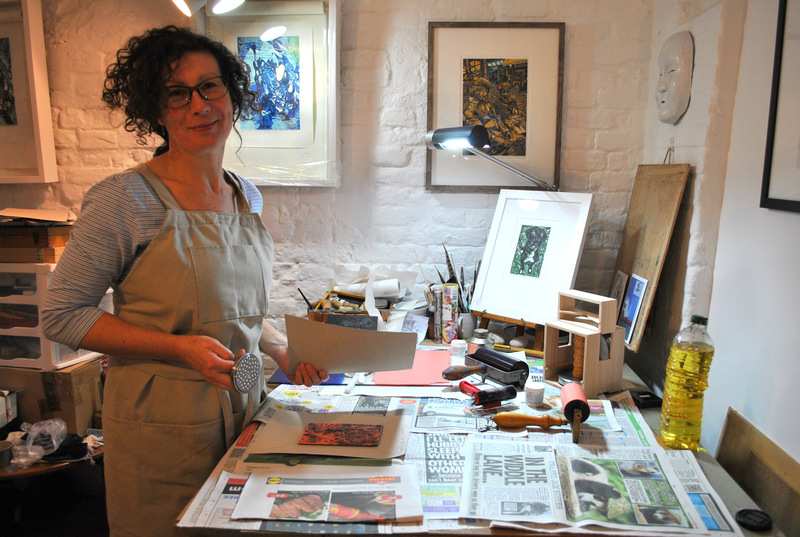 Currently I use intaglio and relief printing techniques such as; etching, drypoint, collagraph, linocut and Monoprint. 'When an Artist looks around their environment they are not only observing but noticing something. Also they may be aware that their observations are coloured with their own ideas and or physiological impressions, which can impact on their approach to what they are creating, giving it is character. In my more recent work I have been exploring the personal meanings of objects and places and what they convey to us over time. I like the idea that the context of an artefact or a place can have a powerful influence on our understanding of it and the emotional responses that we are likely to have towards it’.